One of the most important—yet most neglected—car maintenance tasks is professionally aligning your tires. Not only does proper alignment extend the longevity of your tires, but it is a crucial part of vehicle safety as well. Below, Automotive Maintenance Services, the most trusted and experienced auto repair shop in De Soto, MO, explains what tire alignment is and why it is so important to have it performed regularly. During an alignment, a technician calibrates your vehicle's suspension so that the tires make proper contact with the road. To do this, the auto repair professional adjusts the "camber," "toe," and "caster." Camber is the vertical inward or outward lean of the tire. Toe is the difference in the forward direction the tires point, and caster is the angle of the steering axis when viewed side-on. These must all be adjusted, so the tires provide the greatest amount of traction and surface friction. Alignment is crucial both for safety reasons and for tire longevity. For instance, when the camber is off, only the outer or inner treads make contact with the road, so you have less stopping power and less traction on the road. It also causes the rubber to wear out more quickly in one spot than in others. When the toe is off, the wheels point in different directions, which tends to pull the rubber apart and leads to handling problems. For instance, you might notice the steering wheel is off center, and it may start to shudder at high speeds. Other problems include a tendency for the car to veer left or right when you let go of the wheel. These are all driving hazards that should be avoided. Therefore, if you notice any of these symptoms, schedule immediate service with a reputable car repair shop. 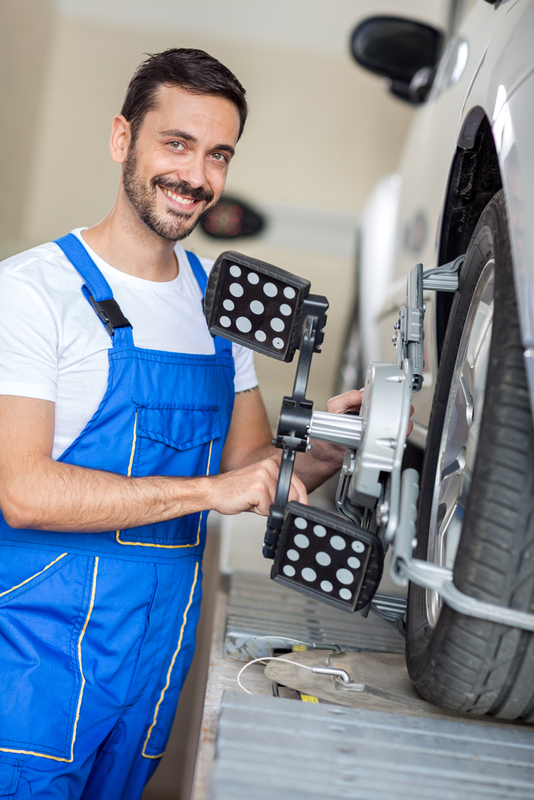 To stay safe and keep your tires in top condition with regular alignment, contact the experts at Automotive Maintenance Services, the premier auto repair and oil change facility in De Soto, MO. They provide fast, reliable service at an affordable rate. Visit their Facebook page to view a map and business hours, or call (636) 586-4465 to schedule service with a friendly staff member.